The outdoor spaces on your property are no less than a boon. If designed and maintained well, they can become the perfect leisure spot where you can relax with friends and family. We at Landscape Magic are one of the most well-known landscaping companies and cater to clients across a large part of Verde Valley, Flagstaff, Lake Montezuma and Munds Park. We have been operating in this field since 2004 and have created a distinct niche for ourselves. Over the years, we have also catered to a large number of customers in and around Sedona, Cottonwood, Village of Oak Creek, Cornville and Clarkdale. We have handled a variety of projects for these clients and many have also asked us to design and install custom stonework elements or veneer cladding on various areas of their property. We are a company that has developed a vast amount of expertise in the field and handle every project , big and small with the same amount of dedication and expertise. There are a number of things that are involved in these installations. Take a look at what these are. Landscaping is always a combination of different elements such as softscaping (plants, trees, shrubs etc), hardscaping (the concrete elements like pathways walls etc), as well as water features and installations such as fireplaces, fire pits etc. This also means it’s important for a landscape designer to maintain balance in the landscaping. 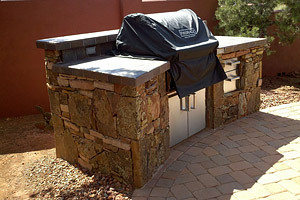 There is one other aspect that lends a great deal of allure to any outdoor space – customized stonework. So what exactly is this? Natural stone is a very versatile material that is available in a number of varieties, colors, textures and finishes. Many people now opt to use stone garden steps, retaining walls, fireplaces and fire pit settings etc. This is all referred to as stonework- in most instances it will be customized to match client’s tastes and preferences and the look of the existing elements in the landscaping. The stone fireplace or outdoor kitchen may be constructed using flagstone, bluestone, marble, travertine, limestone, slate, sandstone or granite tiles. Stone veneers are nothing but thin, tile-like slabs of natural stone. They are used to clad concrete features in the landscaping such as retaining wall, boundary walls and seating wall, fireplaces and firepits, outdoor kitchen columns and walls, patio and decks spaces and the exterior of house walls too. These natural stone veneers give the wall the appearance of stone, without the higher price tag that natural stone has. Since they are essentially made of stone, they too will have similar options like the stones used in landscaping. When we handle custom stone installation or veneer installation, you are assured that the highest grade materials and workmanship will be used. Regardless of whether you want garden steps or a natural stone rockery, walkways, pavers or any other landscaping installation, we are the company to call. You can use this web form to send us your queries or request for a free quote. You can also speak with the Landscape Magic experts at 928-284-9314 and tell us what your requirements are. We handle end-to-end landscaping projects including landscaping and property maintenance, construction of retaining walls and installation of pavers and water features too.